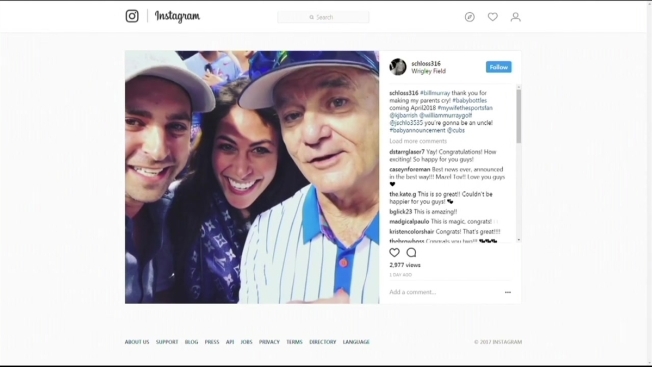 It’s not uncommon for fans to spot Bill Murray in the stands of a North Side Chicago baseball game, but two Cubs fans now have an unforgettable memory after meeting the celebrity actor at Wrigley Field. It’s not uncommon for fans to spot Bill Murray in the stands of a Chicago baseball game, but two Cubs fans now have an unforgettable memory after meeting the celebrity actor at Wrigley Field. Murray, who has been known to crash engagement photoshoots and even make a toast at a bachelor party, has now played a role in a baby announcement. Robbie Schloss posted a video to Instagram over the weekend alongside Murray and Schloss’ wife Kirsten Barrish Schloss at a Cubs game. “#billmurray thank you for making my parents cry!” the caption on the video read. Schloss and his wife are expecting their baby to arrive in April 2018. Murray also went on to sing the seventh inning stretch during that game. Considered one of the Cubs' biggest celebrity fans, the star actor is also reportedly being considered for the role of Cubs manager Joe Maddon in a movie about the team's 2016 World Series run.